apartments with all mod cons, airy, extremely comfortable and suitable for occupation for that romantic weekend, family holiday or for a business wishing to put up delegates for the week. We offer really great deals for mid week stays within 2 weeks of the stay - make us an offer if the property is available! Hi, we are Julian and Jan. We have been running holiday lets for over 9 years. We ensure that they are kept up to date, always clean and go out of our way to meet any personal requirements including arranging dinner parties or even booking tickets for a night out. Just let us know! We have chosen to live in Brighton as it has everything - sea, walking, theatre, festivals, pubs and very quirky fun inhabitants. It means we are nearby should you need any help or should there be an issues we can respond immediately. The places we have all have some games books and DVDs should you get a bit of wet weather or fancy a cosy night in. There is also always heating under your control and unlimited hot water. Brighton is the most cosmopolitan city in England. Their is always something going on whether it be the festival in May (a pre cursor to the Edinburgh festival), shopping in the laines (renowned for their individualism), the sea, the Beach, the Pier, The Marina, The theatre, the restaurants, the people, the Pavilion, concert halls, the South downs and of course the sunny weather! The property is directly on the seafront with easy access to the beach. We are situated right in the heart of Brighton close to all the new i 360, shops, restaurants, cinema, sea and night life. A communal washing machine is available in the basement. A tumble dryer is available in the basement. All towels are provided. Please bring your own Beach towels! Large living room with sea views. 3 comfy sofas plus dining table and chairs. Lots of books at the apartment plus an exchange library in the building. Their are 3 good golf courses in Brighton area. 3 miles from the flat. Notes on accommodation: The apartment is finished to a high standard with the flexibility of having twin or double beds in each bedroom. Wifi is freely available. The owners will also provide a welcome pack on request. Outside: The beach is your garden however their is a childrens play area 50 yards away with a lovely paddling pool. You can play boules directly outside in a specially designated area. Also the meeting place cafe and a gorgeous bandstand that has recently opened a restaurant and coffee shop. You are close to the new i 360 for great views across the city. Great location, love Brighton. Clean and secure flat, owners easy to deal with. 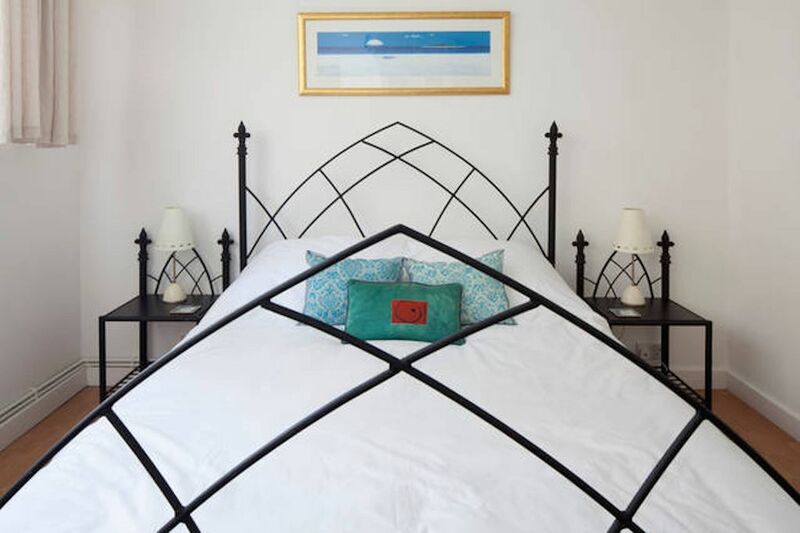 A lovely little flat, walking distance from both Brighton centre and Hove and right on the seafront. Great for an early morning run along the promenade. Julian was great! Very easy and efficient to communicate with from the beginning and because I had ongoing questions, I really appreciated this! He met us at the apartment upon our arrival and toured us around, including the laundry room (which after a week in London during a bit of a heatwave we really needed). Everything about the apartment and property were exactly as described and photographed. Super cute and clean. The location is great! Just the main road (Kings) separating you from the beach/boardwalk. However, being so centrally located and on the ground floor, corner unit comes with some drawbacks like non-stop noise. I do need to mention we live in a very quiet place, but honestly I think the street was quiet between 3-4am and then started all over again. The other issue was the lack of any ability to circulate air. We mentioned this to Julian and he was responsive and offered to bring over fans (our visit was during the three weeks of year where the UK is hot and humid). I suggested that several fans in the apartment might not only help circulate the air but also provide some "white-noise" to help mask the street noise. Although we could open the windows, it would have made the place that much more noisy. I am surprised that none of the previous reviews mentioned the noise and Julian himself seemed surprised when I told him we chose to end our stay after 1 night and move to a hotel. Little extras that I appreciate and come to expect in a VRBO were missing like a jug of shampoo/conditioner/body wash. Being across from the beach, beach towels (I know the listing clearly says bring your own, but we traveled from California and had limited luggage space for things like this). A stones throw from the beach! This flat is clean, with good facilities, in a great location. Six of us/three couples, stayed in this flat over the May Bank Holiday weekend and had a fabulous time. The flat is only a 15/20 minute walk from the train station and 10 minute walk into town. The bedrooms are all a good size and the beds were really comfy. There is everything you need in the kitchen for cooking. It was a nice touch that a few essentials were provided such as tea bags and sugar. There’s a dining room table which the six of ate round on the first night and a nice sitting room for relaxing. There is only one bathroom so you do have to get a bit organised in the morning but it’s not a big deal. Just behind the flat are some lovely pubs, restaurants and a handy co-op if you want to stay local. Julian was fantastic from start to finish, helping us organise parking and other bits. He always responded to my messages extremely quickly. I would recommend this flat to anyone visiting Brighton. We had an excellent week in this lovely flat on the sea front. It was spacious enough for the whole family, clean, comfortable and well equipped and Julian was a very helpful host. We would thoroughly recommend it and hope to be able so stay there again ourselves. The region is one of the most sought after in the UK. Great places to visit with lovely gardens, history and heritage, castles, stately homes and historic houses, family amusement parks and wildlife centres, steam railways and caves. Sussex boasts numerous theatres and arts festivals, golf courses, horse racing, many ancient churches and buildings plus large Areas of Outstanding Natural Beauty over the South Downs and Ashdown Forest. Brighton is the most cosmopolitan city in the UK. Children's play area and beach directly opposite. Brighton shopping (the laines! ), restaurants, sea world and night life all nearby. Booking Notes: We accept weekend and full week bookings. Weekend bookings are 3 nights minimum Thurs to Sunday or Friday to Monday or Saturday to Tuesday. We will send you a booking form via the internet with all our details by return. We require a £300 holding deposit upon booking and request final payment along with a £350 returnable security deposit 6 weeks before your stay. So if both rented they can accommodate 12. Each property has 3 double bedrooms. Changeover Day: We normally change over on Fridays and Mondays. Notes on prices: Please note that the nightly prices shown are for weekends. We offer large discounts for bookings during the week. Prices range from £145 per night up to £300 per night in high season. Please email for last minute availability and prices. Both properties have the same price structure as unit 1 (Ground Floor) Thank You.